With Shadowhunters gearing up to make its January debut, fans are eager to see how their favorite series will make the transition to the small screen. While adaptations are never 100 percent carbon copies of their books, the focus is always on how faithful adaptations manage to stay to its source material. 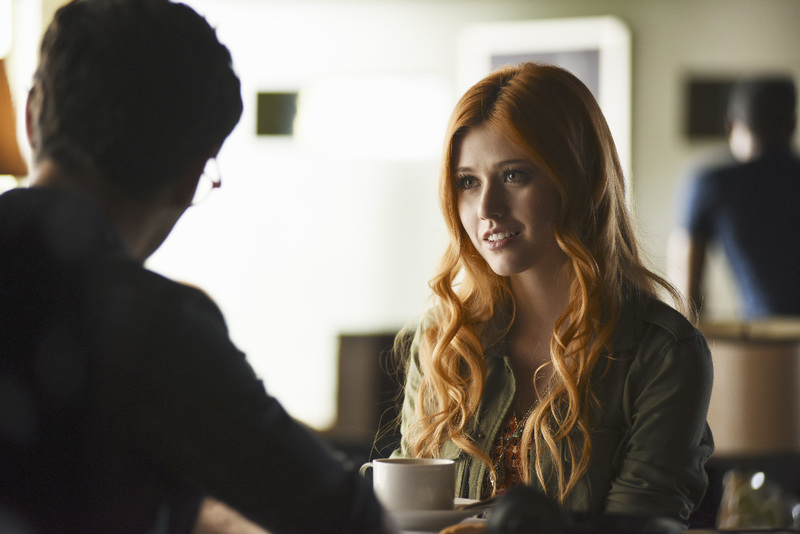 We had the chance to chat with Shadowhunters star Katherine McNamara about the challenge of staying faithful to the books and yet making it fresh, as well as portraying the strong Clary Fray, her favorite relationships in the series, her favorite thing about the show, and the rapport of the Shadowhunters cast. STAYING FAITHFUL TO THE BOOKS │ The most challenging aspect of adapting a book series to new media is ensuring that you’re staying faithful to the source material. It’s what fans expect, but it’s something that can prove difficult. When we spoke to McNamara about the challenge of staying true to the essence of this story and these characters, she told us that it’s something that they haven’t taken lightly. But with any adaptation there are going to be changes. While the first season essentially covers the first book (City of Bones), there will be additions from books 2-4 and certain elements of the series that will be changed. PORTRAYING CLARY FRAY │With The Mortal Instruments fans have gotten a strong female hero to look up to and follow through her ups and downs with Clary Fray. When it comes to portraying that strong female character that so many people look up to, McNamara called landing the role of Clary “a dream come true,” but she also understands the huge responsibility that comes with portraying a beloved character. THE MALEC EFFECT │With the books being as popular and appreciated as they are, fans have become attached to the series’ central couples, and that’s something that McNamara said that Shadowhunters is being sure to take care of. While McNamara loves the traditional ships like Clace (Clary/Jace), Malec (Magnus/Alec) and Sizzy (Simon/Isabelle), she admitted that she is partial to Malec. THE LOVE TRIANGLE │One of the central elements in the first part of The Mortal Instruments is the love triangle between Clary, Jace, and Simon. That’s definitely an element of the book that we’ll see in Shadowhunters. LADIES SUPPORTING LADIES │More often than not television lacks a central focus on the importance of female relationships, which we often find them pitting women against women. One of the relationships that McNamara is most excited for fans to see is that between Clary and Isabelle because it really focuses on the cultivation of that relationship and two strong women being strong without tearing each other down. MAKING FANTASY A REALITY │While The Mortal Instruments has always been a thrilling, exciting adventure, and its core it’s been the relationships that have resonated with fans and made the series one that has had such a profound impact on so many people. For McNamara, that’s her favorite part about the books and about Shadowhunters. THE CAST DYNAMIC │It was clear from the start that the cast of Shadowhunters was composed of a diverse group of people who all instantly clicked. Whether it was the behind the scenes photos or live streams of late night games of Werewolf, the chemistry is definitely there. McNamara called the cast “another family,” one that has already been through so much together even before the series’ debut. But aside from the fun and games of it all – which are always to be had – McNamara credits this cast with helping her grow both as an actor and as a person. Thanks for all the Shadowhunters updates! I appreciate it 🙂 So excited!! !